From around now back in 1995: THERMAL LANCE issue 25 and a line-up of of-the-time telefantasy shows which - with one exception - have been all but forgotten about today. Plus STAR TREK of course. This is also the 300th STARLOGGED post of the year. Yay! From June/ July 1978: COMIC MEDIA NEWS issue 36. 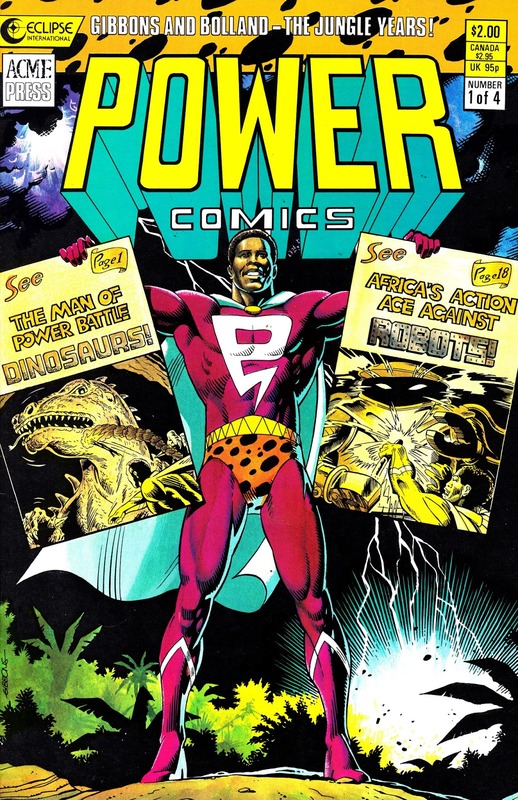 From March 1988: POWER COMICS issue 1, another title (see also: the recent JAMES BOND post) that emerged from the tie-up between Britain's Acme Press and Eclipse over in the States. This one was a genuine oddity: reprints of early work by Dave Gibbons and Brian Bolland originally created in the 1970s for export... to Nigeria! The principle character was - originally - Powerman but the lawyers spotted a potential snag with that so he was renamed Powerbolt for these reprints. The strips, written by Don Avenall and Norman Worker, first appeared in the bi-weekly POWERMAN comic published by Pikin (or was it Pican?) Publications. I have no idea about how Bolland and Gibbons felt about their early work resurfacing after they had broken through to the mainstream. I wonder how well they managed to capture Nigerian life and sensibilities... I can't help suspecting that this is the Nigerian comics equivilant of our very own Gen 1 CAPTAIN BRITAIN... an overseas creation pitched at a foreign market put together by creators with little or no first-hand audience about the place or the audience. They got the gig because, traditionally, Nigerian comics had been imported from overseas and the publisher saw an opportunity to create something more atuned to the local market and - importantly - featuring local characters. But - and this is where the Brits come in - there wasn't a big pool of local talent to work on such a title. The thinking was that - over time - a new generation of African creators would see an opportunity. This four-part series has itself been out-of-print for nigh on thirty years. It's not related to the 1960s Odhams Power Comics line which - mostly - repackaged early Marvel strips for the British market. 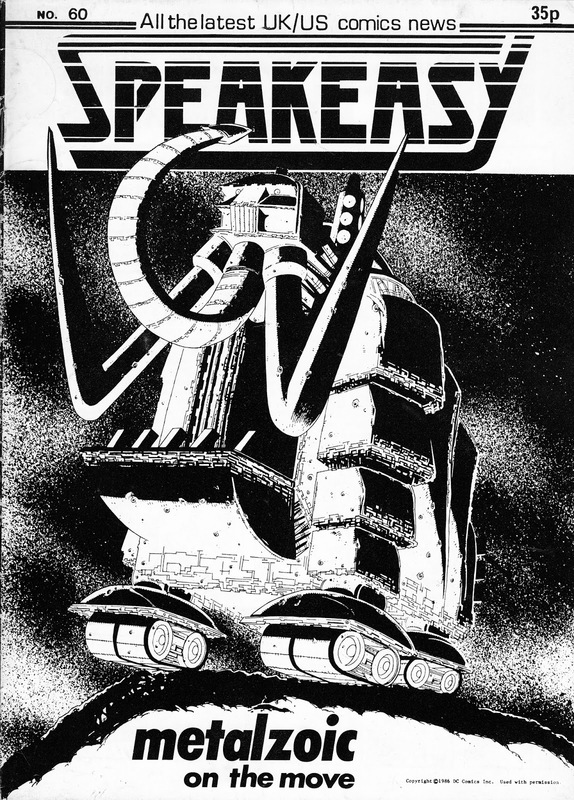 From March 1986: SPEAKEASY issue 60 cover features METALZOIC, the Pat Mills and Kevin O'Neil collaboration which first appeared as one of the early DC Comics graphic novels in the States before being serialised in 2000AD (progs 482-492) here in the UK. The timing is right as I'm currently reading Mills' recolections of his time on 2000AD in the book BE PURE! BE VIGILANT! BEHAVE! which is now available as a print edition. I find Mills to be rather too opinionated at times (he certainly has a lot to say in FUTURE SHOCK, now available in a swanky new BR edition from Arrow) but his writing here is most agreeable and it's hard to deny the creative force that he has been in British comics. Indeed, his contribution is almost certainly still undervalued in the grand scheme of things. 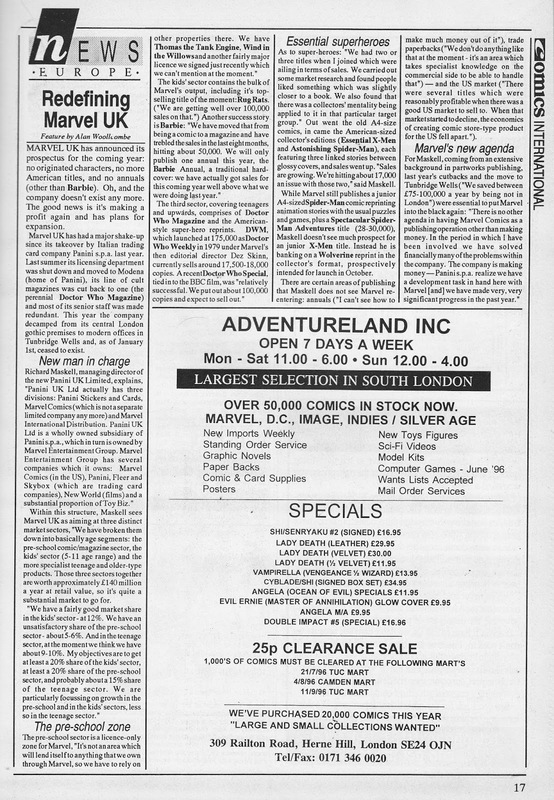 From October 1988: the first issue of Fleetway's new fortnightly WILDCAT. This is something of a landmark title: not only was it the first time (as far as I know) that IPC/ Fleetway had launched an anthology where all the strips shared the same universe but also the last time that they took a punt on a boys adventure title that wasn't either based on an existing media property or spun out of one of their existing titles. 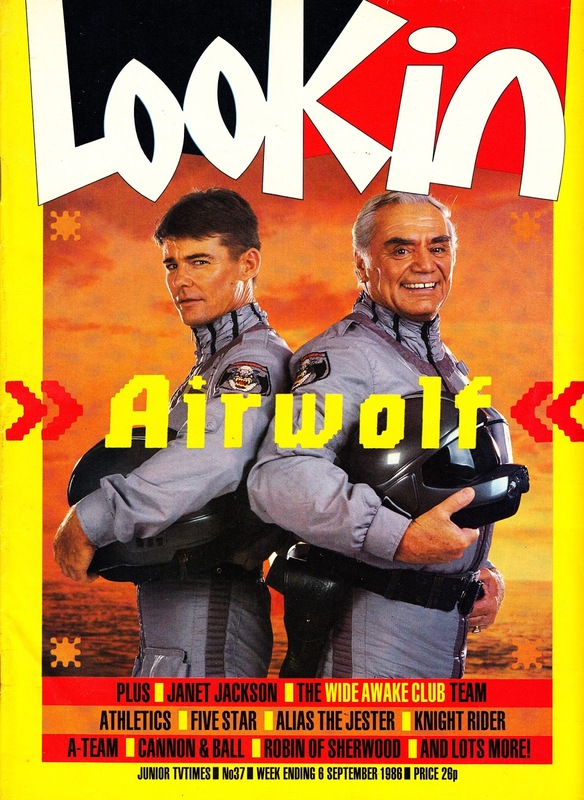 It's ambitious stuff with a top-notch creative team (Boix, Belardinelli, Ortiz, Pino, Smith and others) and a remit to do something different at a time when the boys adventure market was really on its uppers (even Marvel UK was discovering that a heavily promoted toy tie-in were no longer pulling in the punters in sufficient numbers to keep the lights on at a number of weeklies) and only toy tie-ins seemed to have any chance of survival. 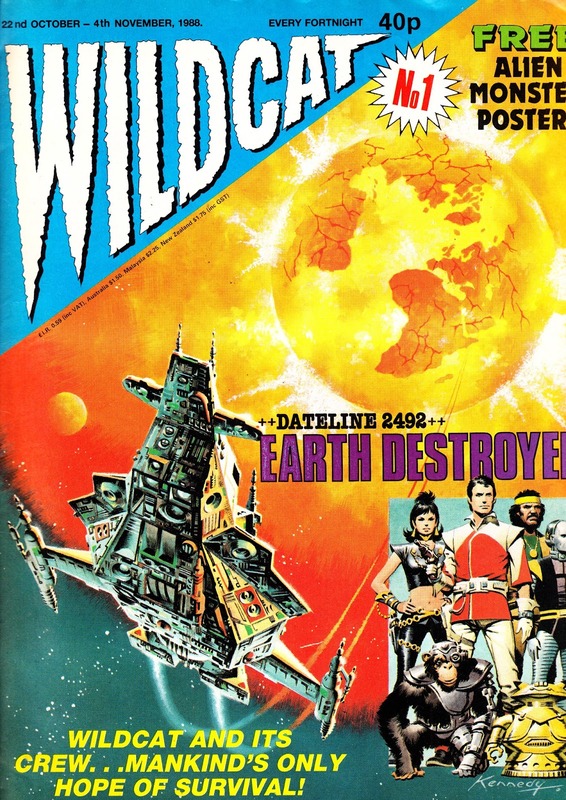 The shared universe premise was not a million miles away from Glen Larson's late 1960s unsold effort Adam's Ark (which was drastically reworked a decade later to become BATTLESTAR GALACTICA): Turbo Jones predicts the impending destruction of the Earth in a meteor shower and constructs a space craft (the Wildcat) to whisk a select group of survivors off world in search of a new planet to colonise. Cue: various alien-centric adventure built around the four main characters: Jones, Loner, Kitten Magee and Joe Alien. 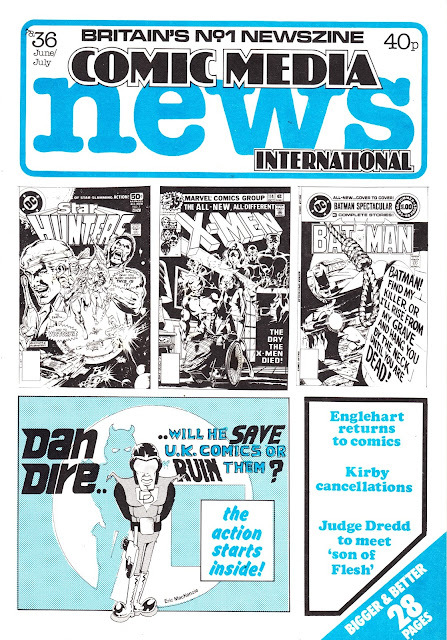 The fortnightly was teased with the now traditional preview issue giveaway, bagged with copies of 2000AD, EAGLE and (presumably in an attempt to broaden the audience) WHIZZER AND CHIPS. Only twelve issues appeared before a hasty merger with - predictably - EAGLE (issue 368, 8 April 1989). Two further specials, now very hard to find, followed in 1989. Unusually, these probably weren't just burning off unused inventory as the strips were also appearing in EAGLE every week. There was also two Stateside spin-offs courtesy of the often rough-and-ready Fleetway Quality imprint: the Loner strips were collected into a US format title that clocked-up a not-to-be-sniffed-at seven issues in 1990-91. Turbo Jones: Pathfinder mustered a one-shot in 1991. Neither title is particularly easy to find in the 50p boxes. From sometime in the 1980s: STAY TUNED, the officially authorised (TV) AVENGERS magazine (actually a fanzine) issue 1, published by ubiquitous Avengers go-to guy Dave Rogers. From July/ August 1975: COMIC MEDIA NEWS issue 21. Last but not least: Here's Philip Schofield again, providing the links for this third-and-final straight-to-tape compilation of old British kids TV clips. This time we're into Scofield's own era.... the 1980s. This looks like it is a reissue as the packaging doesn't match the design of the previous two... or this tape was released after the others and - in the meantime - the line was overhauled and moved under the Pocket Money Video umbrella. Kudos to the designer for making it look like something a kid could knock-up in under an hour. Some of the shows featured actually had their origins in previous decades but I guess Watershed felt they could justify their inclusion here thanks to their periodic reruns by frugal broadcasters across the years. These tapes, in their own simple way, were really the predecessors to Network's excellent range of LOOK-BACK DVDs. 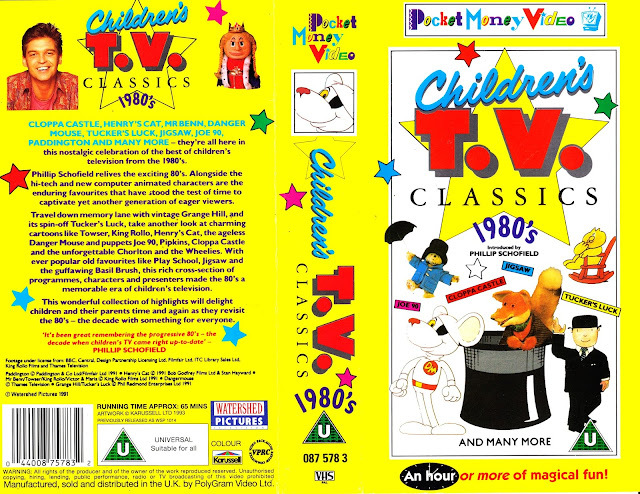 Like the ITC Video TV HEAVEN tapes of the past, they took complete episodes of assorted ITV kids shows to allow you a nostalgic dip without having to fork out for a complete series-specific DVD. They focused on the 1970s (some 1980s volumes wouldn't have gone amiss) but - even if you didn't see the shows first time around - are still great ways to dip into a whole era. The only bummer: kids TV drama was often multi-part rather than self-contained so you don't get the full story. Fortunately, Network has also released most of the dramas featured as individual series. From the Age of Tape: A post-Broom Closet/ pre-grey Schofield fronting-up a compilation of kids telly clips from the 1970s. 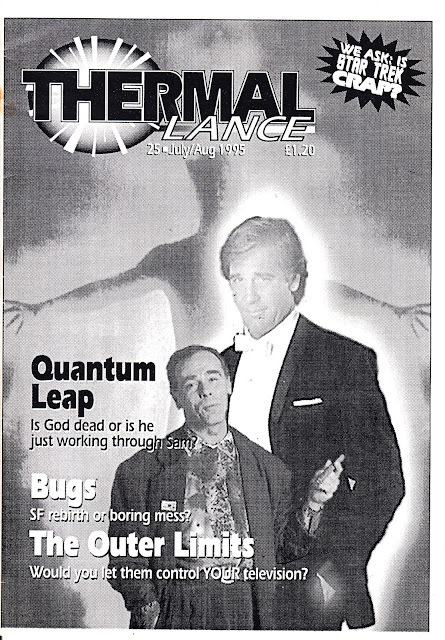 From May-June 1995: the 24th issue of THERMAL LANCE. 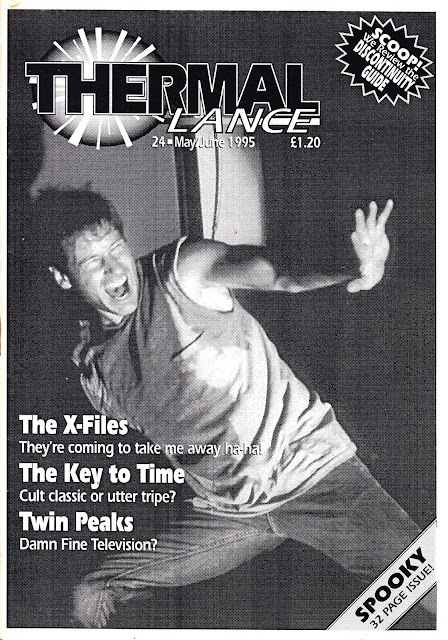 With a punter-pleasing X-FILES cover. Of course. From the VHS era: The first of three Schofield-fronted tapes, from a time long before YOU TUBE, with assorted clips from vintage shows from the 1960s. Predictably, two further decade-related tapes followed. And we'll get to those. From memory, watershed did a pretty good job with these straight-to-tape productions, licensing a good range of clips from a variety of rights holders. As far as i know, none of the tapes were reissued in the DVD era which makes them 'lost' in the digital age. From 1989: the first issue, published in a swanky format, of Mike Grell's JAMES BOND 007 comics adaptation PERMISSION TO DIE. 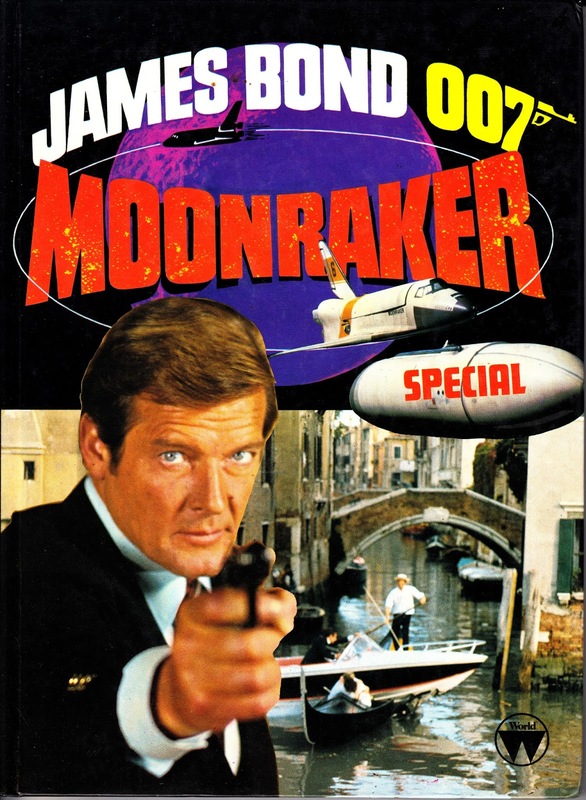 This marked Mr Bond's return to comics after a hiatus of several years since the Roger Moore era Marvel movie adaptations. This, in contrast, was an original story (written and illustrated by Grell) and not directly based on any existing movie or Fleming novel. 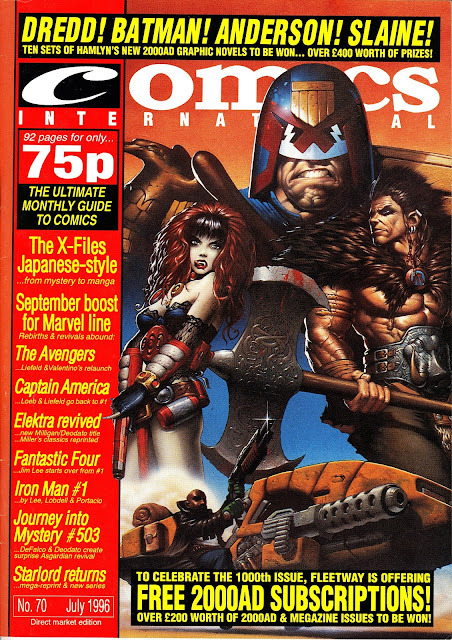 A patchy publishing schedule meant the third issue didn't appear until 1991. That, and the collected edition that followed, seem pretty hard to find. Not that I have looked too hard. 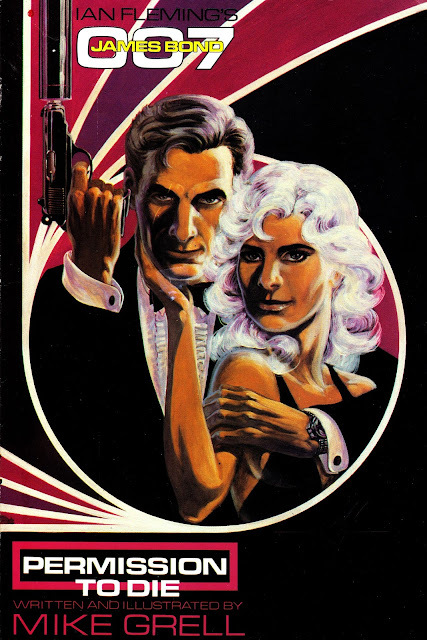 Eclipse also published an adaptation of the movie LICENSE TO KILL, but i don't recall ever seeing a copy. Co-publisher Acme Press was a spin-off from British fanzine SPEAKEASY. Other titles from the outfit included POWERMAN (not THAT one), reprinting rare mid-Seventies Gibbons/ Bolland strips created for export to the Nigerian market.and MAXWELL THE MAGIC CAT, collecting Alan Moore's gag strip from his local paper. 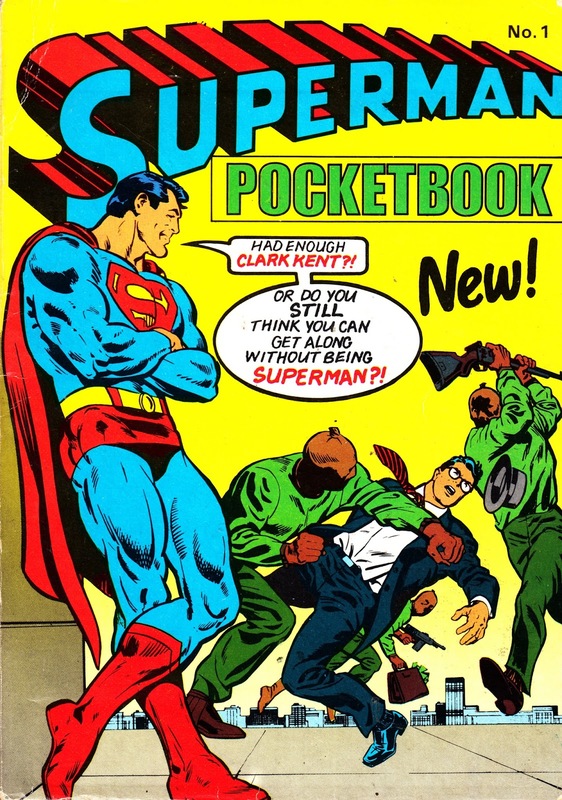 From 1978: the first issue of SUPERMAN POCKETBOOK, a UK DC reprint title from London Editions/ Egmont. Unlike the traditional British Pocket Libraries, this (and its BATMAN POCKETBOOK companion) was published with colour interiors. The upgraded production standards were made possible because London Editions (who eventually had a long - albeit intermittent - association with DC) were part of a bigger European outfit, and the digests appeared in other European markets with the black plates swapped out in favour of the local language during a single print run. The sudden pan-European interest in the character was, of course, down to that year's SUPERMAN live-action movie. The UK-only monthly THE SUPERHEROES followed, to limited success despite boasting attractive new covers and some vintage (albeit possibly dated) reprints from the DC vaults. Once that title faltered, London Editions turned their attentions to other licensed fare scoring hits with the likes of MASTERS OF THE UNIVERSE and MY LITTLE PONY and less success with the likes of THE CENTURIONS and BATTLE BEASTS. But, towards the end of the decade, they rediscovered their DC mojo with a slate of new reprint titles (now in colour) beginning with - as you might expect - SUPERMAN. This expansion may have been prompted by the rising profile of DC characters (Superman celebrated his 50th with some hoopla, including a RADIO TIMES cover, in 1988), the post-CRISIS reboot of many of DC's top tier characters (making them more accessable to a wider audience), the impending BATMAN movie and MARVEL UK's retreat from the superhero market. The new line, anchored by SUPERMAN and BATMAN but also including (at various times) HEROES, DC ACTION, ZONES and SHOCKWAVE, proved to be only a limited success and titles seemed to come and go (departing with little warning or fanfare) on a regular basis. Robert Maxwell, now owner of the former IPC Youth Group rebadged Fleetway, managed to annoy Egmont's European bosses by snatching the Disney license. His ownership of MIRROR GROUP newspapers being a decisive factor in commiting to expose Disney's wares to the largest UK readership possible. Egmont's response was to buy into Fleetway, an offer that Maxwell (no doubt very aware of the financial mess buried at the heart of his media empire) found hard to resist. After his death, and the swift collapse of his crooked empire, Egmont bought the rest of Fleetway for a knockdown price. Labels: 1978, LONDON EDITIONS MAGAZINES, SUPERMAN, SUPERMAN THE MOVIE. 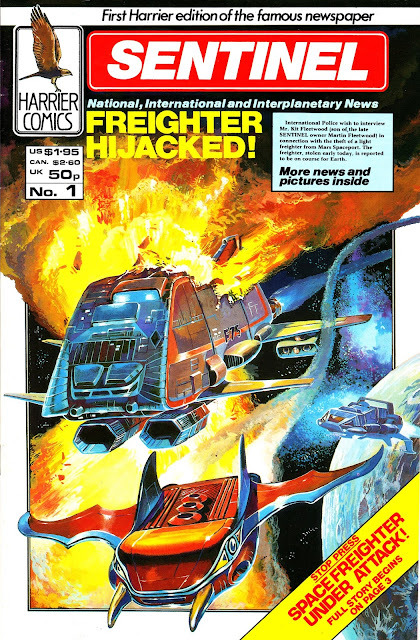 From February 1987: the first issue of SENTINEL, a science fiction title published by Brit outfit HARRIER COMICS, owned and run by Martin Lock. The conceit for this four-issue British indie title was that it presented news stories from the future. It was one of the standouts from a publisher who often seemed to prioritise quantity and good intentions over actual quality. Born of the black & white boom, Harrier launched with CONQUEROR, a STAR TREK wannabe with origins in Lock's days as a fanzine creator, editor and publisher. I've blogged about that in STARLOGGED a long time ago. A host of ongoing series and one-shots followed over the next few years. Some boasted early work by creators who would go on to become well-regarded industry pros. Others were a load of old tosh that almost certainly harmed the credability of the whole line. The collapse in demand for b&w titles (once it became clear that the dreck far outweighed the quality... and the chances of getting rich over the next TEENAGE MUTANT NINJA TURTLES wwas basically zilch) sealed the fate of Harrier and Lock bowed out by the end of the decade. Back issues sometimes pop up in the 50p boxes and I always make a point of grabbing any that I see. From 1988: THE OINK! BOOK 1989. Yup, it's a spin-off OINK! 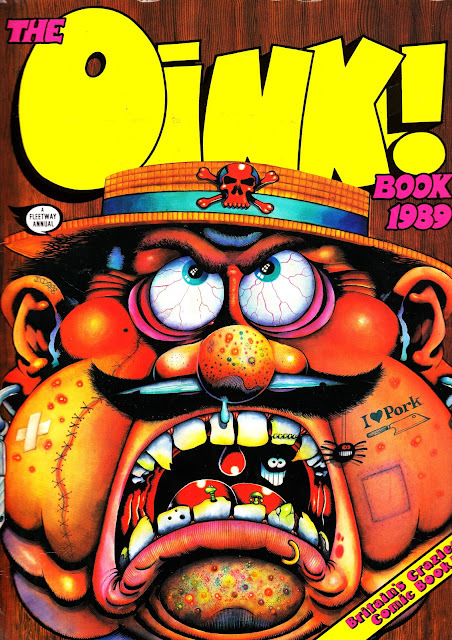 ANNUAL from Fleetway, unusually for the time (although it would become standard for 2000AD and JUDGE DREDD in the following decade) published as an oversized stiff-covered softie rather than the more traditional hardback. 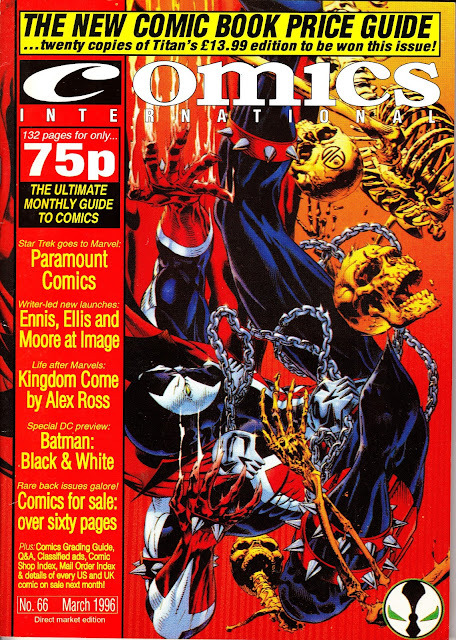 This would have been on sale just as the comic, launched in 1986, was winding down. The last issue - number 68 - was published in October prior to a 'great news pals' merger with BUSTER. The first OINK! BOOK had appeared the previous year but seemed to suffer from patchy distribution, not least because WH SMITH (who, back in the day, would devote large tables or extensive shelf space to annuals) apparently tried as hard as possible not to stock it. A further SUMMER SPECIAL, reprinting material from the comic, went on sale the following summer. Someone even made an OINK! computer game! Pigging brilliant! 1995: DOWNTIME STRAIGHT-TO-TAPE DOCTOR WHO DRAMA VHS, SIGNED BY THE CAST. 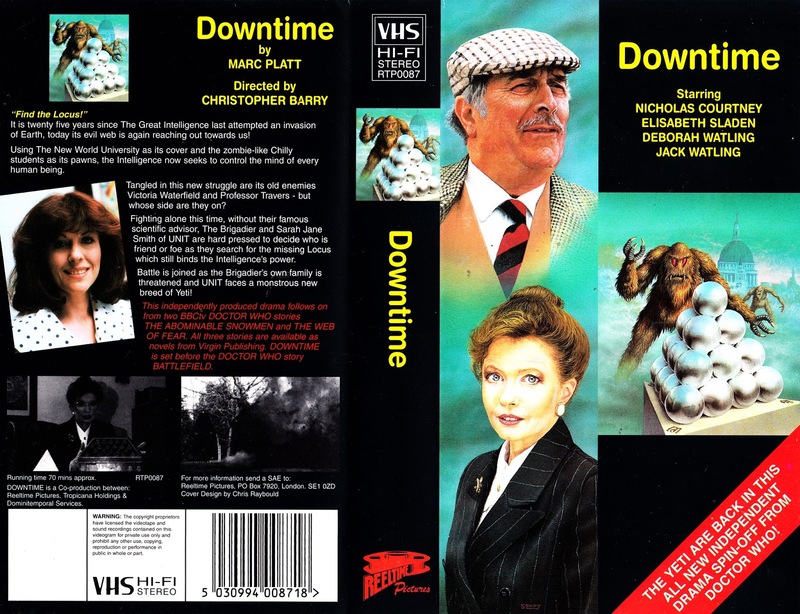 From 1995: The recent death of Deborah Watling reminded me of this... DOWNTIME: a straight-to-tape (via a convention) DOCTOR WHO fan film which reunited some of the show's cast (reprising their characters from the show in a copyright-dodging manauver made possible by the BBC's bonkers contracts) to take on the Yeti. It's OK... and it is good to see so many of the cast in the same production... but it ain't great! A lot of these 1990s fan-made films just demonstrated that making decent TV drama is harder than it looks (despite having some pros in front - and behind - the camera). Reeltime, stepping outside their comfort zone of walk-and-talk interviews, were canny enough to make this look like a legit BBC Video release by apping the sleave design as much as possible. 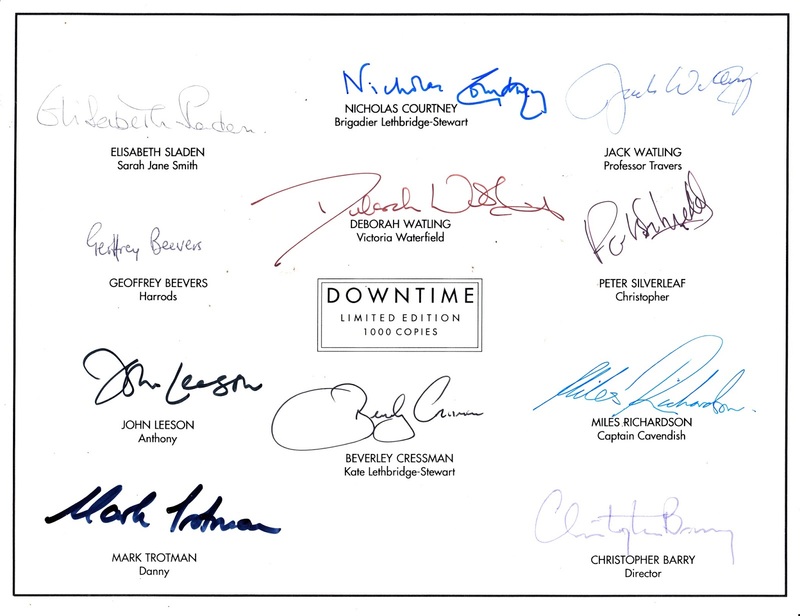 This comes with a bonus... it is signed by all the principle players. Most of whom are sadly no longer with us. There was also a novelisation published by Virgin as part of their DOCTOR WHO MISSING ADVENTURES line (in fact, in keeping with its unofficial origins, the Doctor is all but missing from his own Missing Adventure) and a soundtrack CD. I'm pretty sure I would have bought this VHS from FORBIDDEN PLANET on New Oxford Street when it was first released. I don't remember if copies were sold more widely than the specialist market. 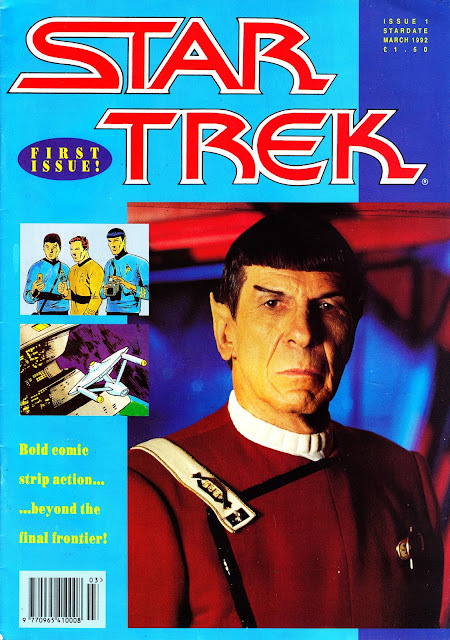 From March-April 1995: More STAR TREK.... 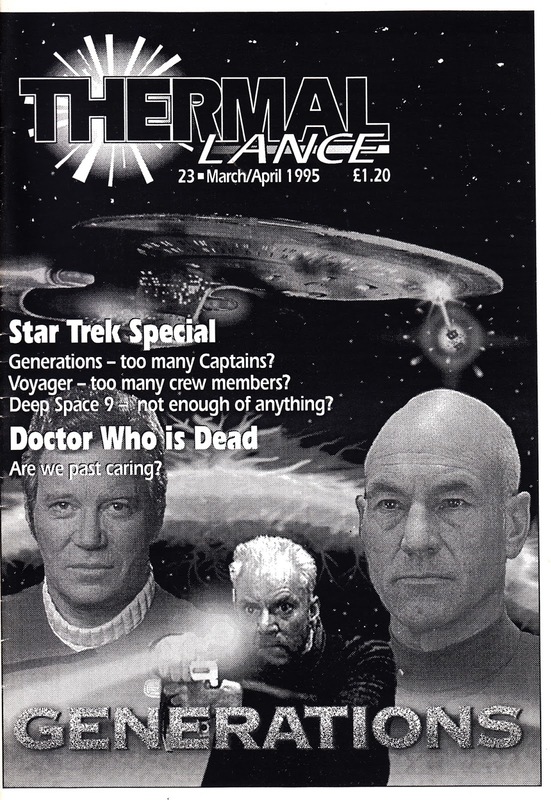 THERMAL LANCE issue 23 casts a critical eye over the whole franchise to coincide with the release of the (frankly underwhelming) STAR TREK GENERATIONS movie. 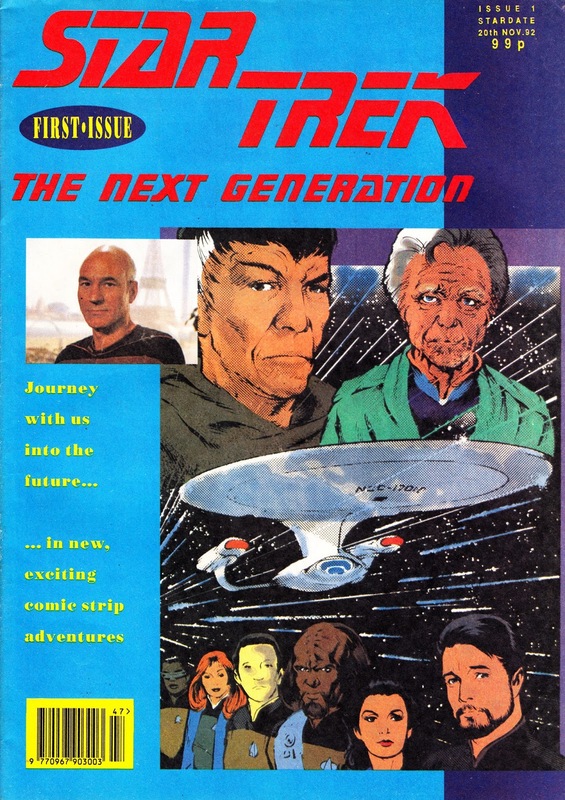 From November 1992: More TREKness... the first issue of the second (even less successful) crack at getting a STAR TREK THE NEXT GENERATION comic off the ground here in the UK. This only seems to have run for a couple of issues. MARVEL UK had the first go but misread the market by beaming out a quick-to-assemble comic full of material that fans could already find imported in their local comic shop. Buyers hoping for a TREK centric version of DOCTOR WHO MAGAZINE had to wait another half-decade until Titan Magazines nailed it. The Marvel version died after only a year or so. This incarnation, an all-reprint companion to the Classic Trek version, fared even worse. Vanishing after only a couple of issues. Clearly the casual and commited fans who were watching the series on BBC TWO and SKY ONE (and buying the CIC vids) weren't rushing to read reprints of the American comics. 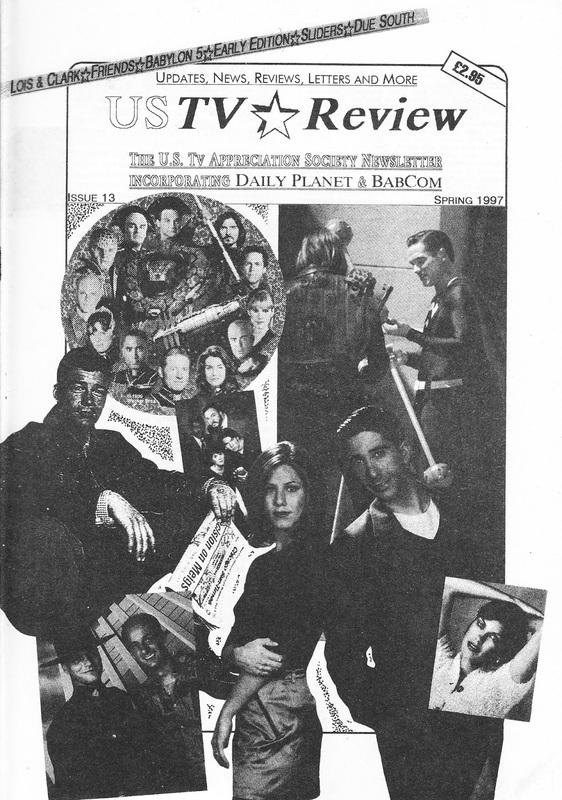 From Spring 1997: a copy of the British fanzine US TV REVIEW, dedicated to contemporary American TV shows. This was actually an amalgamation of several existing fanzines dedicated to BABYLON FIVE (BABCOM: Not to be confused with the UK BABYLON FIVE club magazine I have posted previously) and LOIS & CLARK: THE NEW ADVENTURES OF SUPERMAN (The Daily Planet). The combined title expanded the remit even further to cover other imports. 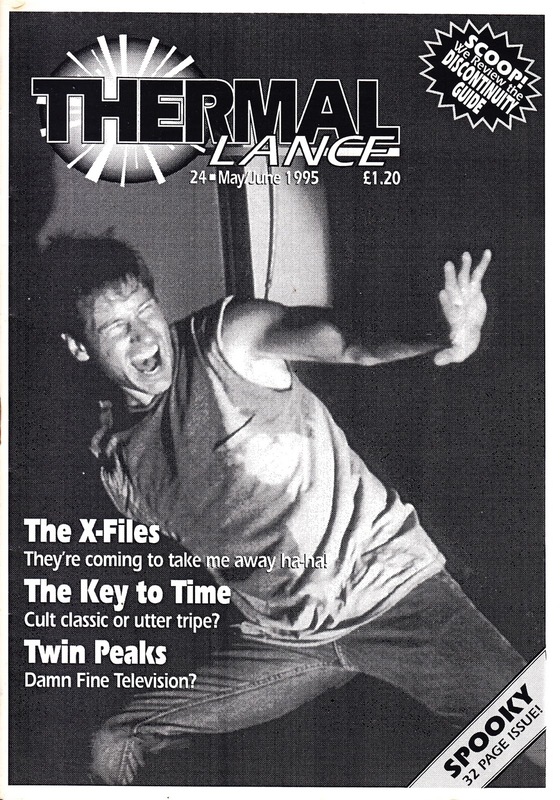 I'm not sure where the issue number comes from... it may have been inherited from one of the merged titles or there may also have been a US TV newsletter (not to be confused with AMERICANA) that was running alongside the two show-specific zines. The memory now cheats. I'm pretty sure I was a regular reader of the titles prior to their merger but - over the years - I have misplaced or dumped all my copies. For some reason, this one survives. I forget exactly how these were advertised. Definately mail order but I don't recall if it was on an issue-by-issue basis or via a subscription. The adverts probably appeared in the classified sections of SFX or TV ZONE. i have a suspicion that this one might not have lasted much longer... or maybe I just stopped ordering it. From 1990, the 'that'll do' cover for ACTION HEROES magazine issue 2, another in the numerous spin-offs from the Starlog Group. From July 1996: COMICS INTERNATIONAL issue 70 boasts an impressive 2000AD cover to celebrate 1000 issues in print (they've done another 1000+ since) and reports on the demise of MARVEL UK (although it did live on, of course, as Panini UK...) after some 23-odd years of UK operations. The end of an era. From 1986: The MARVEL SUPER HEROES SECRET WARS STICKER ALBUM. 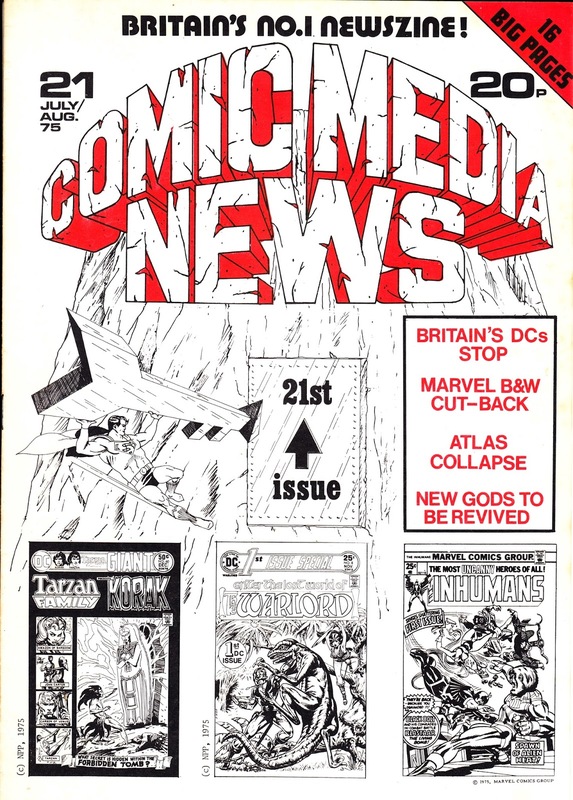 Buyers of MARVEL UK's 1986 weeklies will be familiar with this one... the (empty) album came bagged with copies of SECRET WARS II issue 66, SPIDER-MAN AND ZOIDS issue 31 and TRANSFORMERS issue 81. All cover-dated 4 October. So, if you were a True Believer, there was a good chance you ended up with three of the things! The following week's issues all included a packet of stickers to help fuel the addiction. The timing of this one seemed a bit weird back-in-the-day. 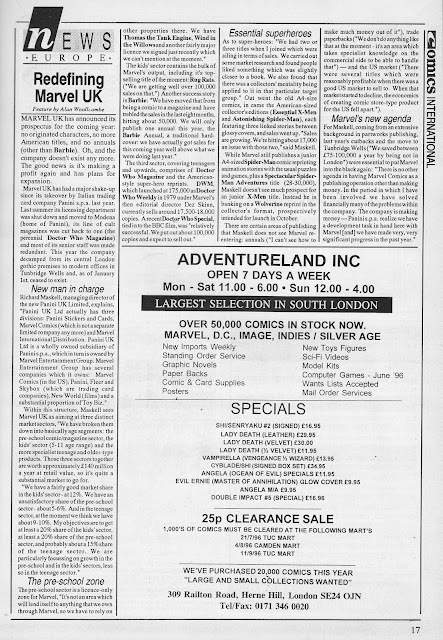 MARVEL UK was deep into the sprawling SECRET WARS II saga (the weekly switched storylines, and title, from issue 32) and the original Battle World romp seemed a little like ancient history. 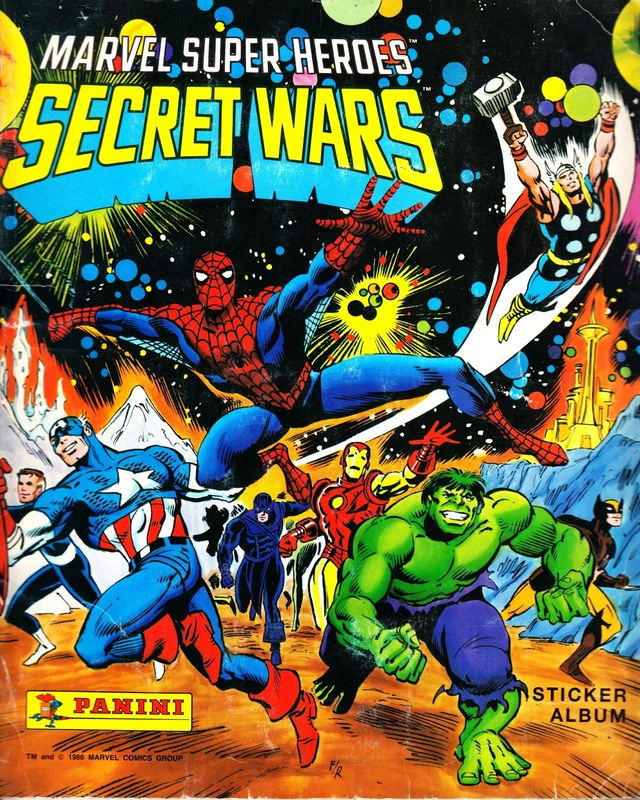 Secret Wars - probably because it lacked the support of an animated series (although this album did briefly spark playground rumours that one was on its way) - never became the same mass marketing event in the UK that it was in the States... but we did get some spin-off merchandising, including the Mattel action figures that sparked it all. 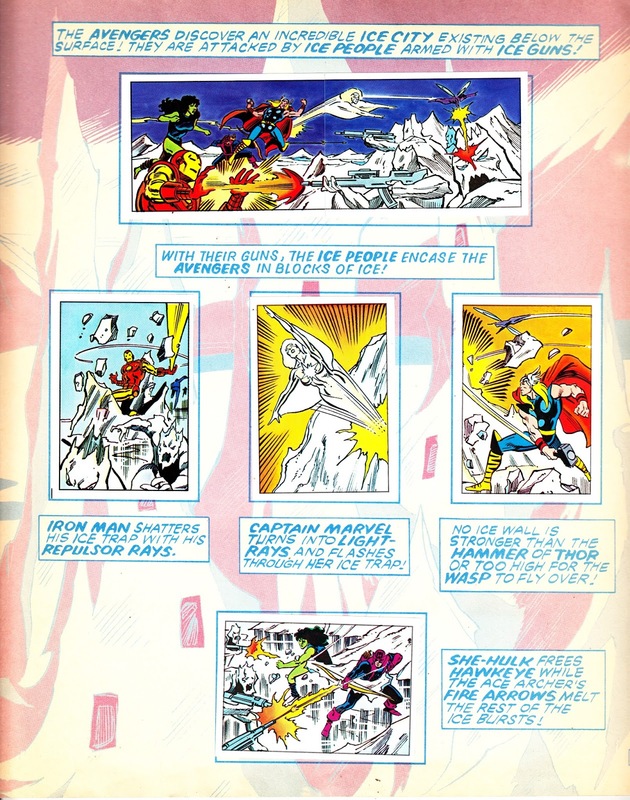 As for the album itself: it basically takes the Jim Shooter-created premise of the original limited series and fleshes it out with more events, as illustrated in the not-seen-in-the-comics page below. Maybe Shooter should get more credit for creating a scenario where - in theory - the heroes and villains could encounter an unlimited number of new threats and challenges. Much like the we're-on-a-quest SF shows of the 1970s. Except they never seemed to last long. The artwork is uncredited throughout. The panels are not lifted directly from the comics so I assume they were probably done by one (or maybe a team) of jobbing artists somewhere. It must have kept them busy for a while... which may explain the relatively late launch. The events of the sequel are - possibly because it was something of a sprawling mess - ignored. The giveaway didn't seem to have much of an impact on my peers. Unlike the TRANSFORMERS album given away earlier in the year, no one I knew (including me) bothered with this one. Maybe it's because superheroes weren't quite as cool in the mid-eighties or maybe it lacked the all-important shiney cards (a gimmick nicked from football sticker collecting). The art - whilst cool - couldn't compete with actual animation stills as seen in the TF collection. Marvel Productions did - btw - punt the idea of a Secret Wars animated series to the US broadcasters but couldn't find any takers. This isn't one of the three albums I ended up with that week. All are now long-gone. I found a completed copy (result!) in a store and couldn't pass up the chance to finally own it. 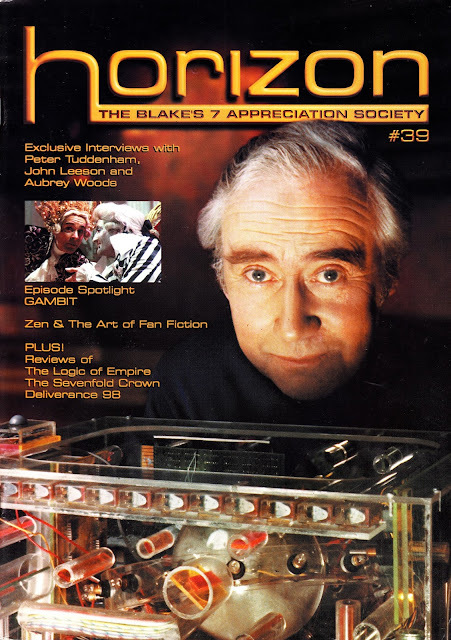 From November 1981: WARREN PRESENTS issue 14. I bought this - for a quid - purely on the strength of the cover... an opportunist homage to iNDIANA JONES (and - let's be honest - there was no shortage of Indy homages in the eighties) and the legacy of pulp heroes in general (of whom Doctor Jones was himself a nod of the hat). 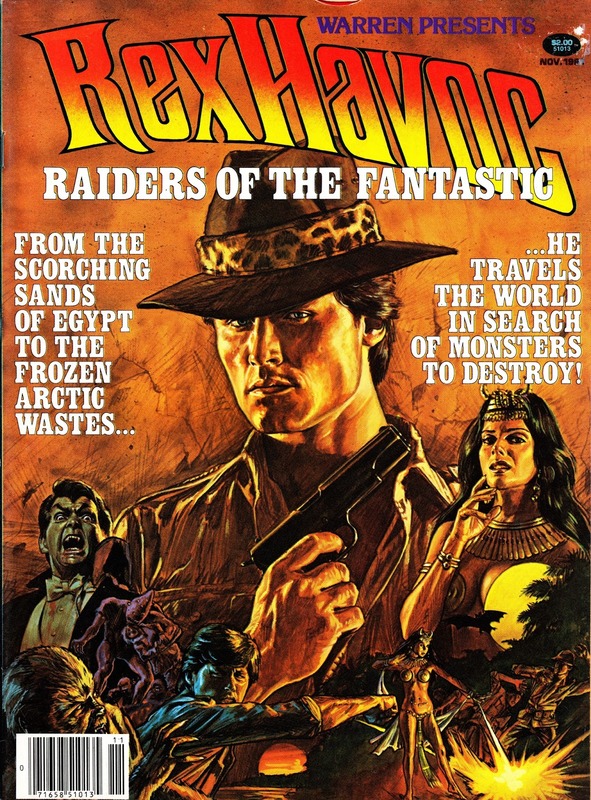 Ladies and gentlemen: Rex Havoc: Raider of the Fantastic! From February 1994: This is an oddity that completely passed me by at the time and I only discovered by chance in a shop's back issue boxes relatively recently... SIG: THE OFFICIAL SUPERMARIONATION MAGAZINE issue 1. 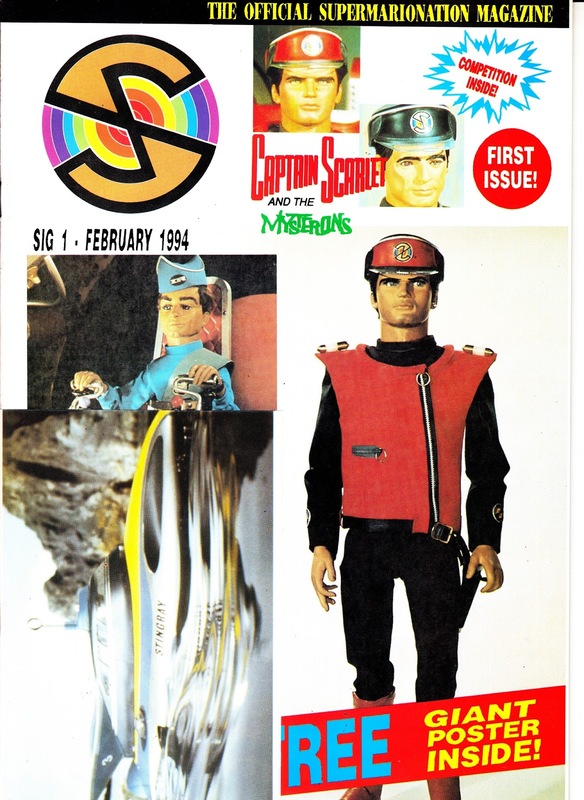 Yup, it's an officially sanctioned by ITC glossy magazine devoted to the puppet shows of Gerry Anderson which - of course - were enjoying a resurgence at the time thanks to reruns on the BBC. 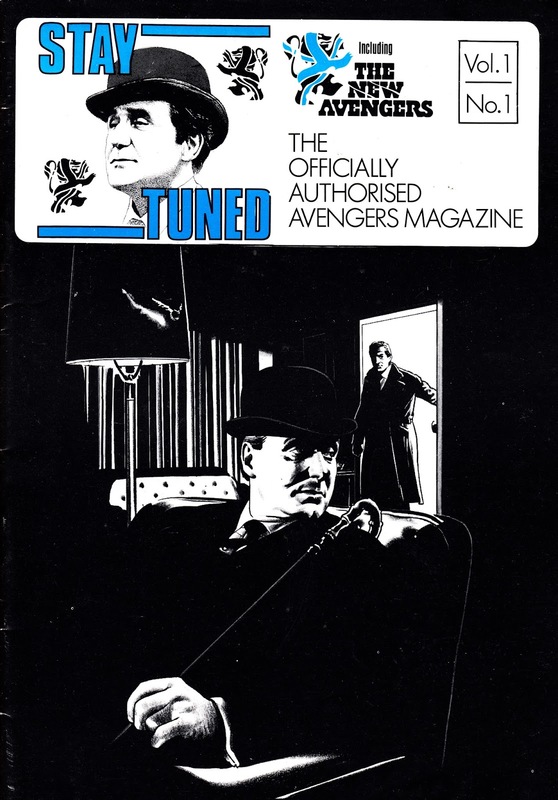 This was far from the first magazine devoted to Anderson's work but it might well have been the first officially licensed (rather than a fanzine endorsed by ITC or Anderson himself) one intended for a mainstream audience. 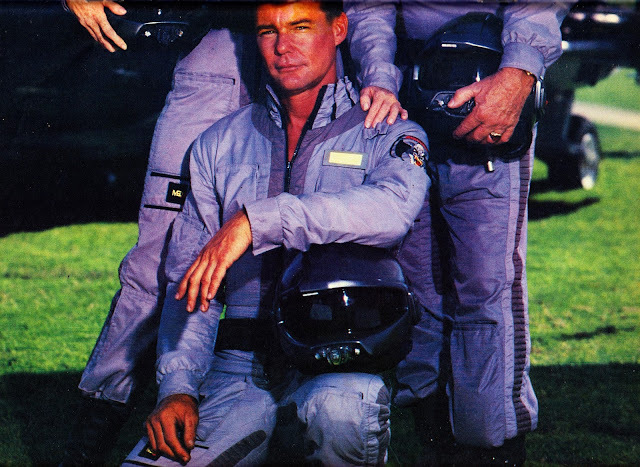 Unfortunately, it was published by Phoenix, the fly-by-night outfit that also published the ALIENS, TERMINATOR, INDIANA JONES, STAR TREK and FREDDY'S NIGHTMARES comics and magazines during this period. Quality control (and indeed permission of the copyright holder) weren't always their top priority. This is - much like their unofficial FINAL FRONTIER magazine (once they los - or stopped paying for - reprints of Starlog articles) - a thin selection of features (don't expect anything along the lines of what S.I.G had been publishing) alongside lots of glossy photos of puppets and hardware. The weird cover layout isn't a major fail (although it is pretty high on the STARLOGGED 'That'll do' scale... and what's with the crappy, almost non-existant, masthead? 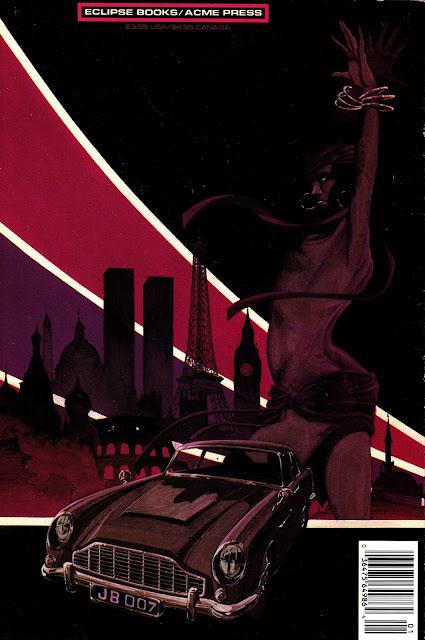 ), I scanned it with the free Stingray postcard obscuring part of the cover. There's no new or reprinted comic strips. I have no idea if this ever made it to a second issue. Based on the strength of this one, and the very few copies that seem to be out there, I would assume not. From April 1990: the 'new' New EAGLE! Another year... another relaunch. And this one is interesting because it took the comic back towards its 1982-83 origins with a greater mix of 'real world' celebs and subjects likely to appeal to the target readership. Definately a move towards a more magazine-centric format... albeit no sign (of course) of the return of the signiature photo-strips from those first 15-odd months. I think the move reflects how much the comics market was struggling at the time and a recognition that the contents had to have a broader appeal. 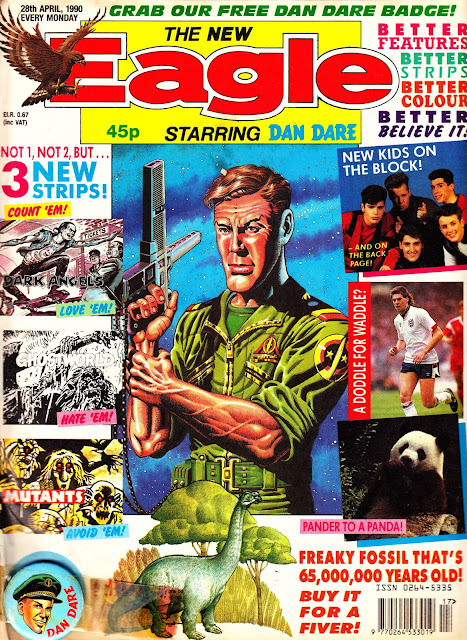 Comic strips were - of course - a mainstay... including yet another DAN DARE makeover. And a DD badge (still attached) as a freebie. From 1975: Relaunch alert! VALIANT gets a last-ditch reboot as sales drop through the floor. It doesn't even rate a mention on the cover (it's one of the other 'two exciting new stories' starting this issue) but this is the first appearance of tough cop ONE-EYED JACK, the DIRTY HARRY-alike recently returned to the streets in a new collected edition from Rebellion. 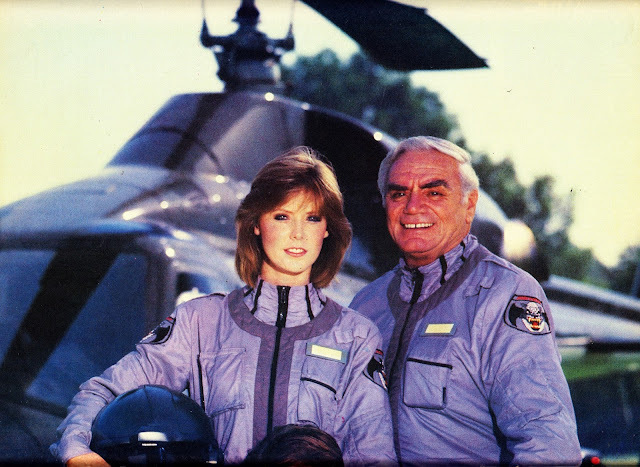 Readers of the EAGLE in the 1980s will remember the curiously-dated cop as well. The relaunch, under the watch of John Wagner, was a creative success but couldn't reverse falling sales. The weekly, launched back in 1962, folded into BATTLE the following October after 730 issues... taking OEJ with it. 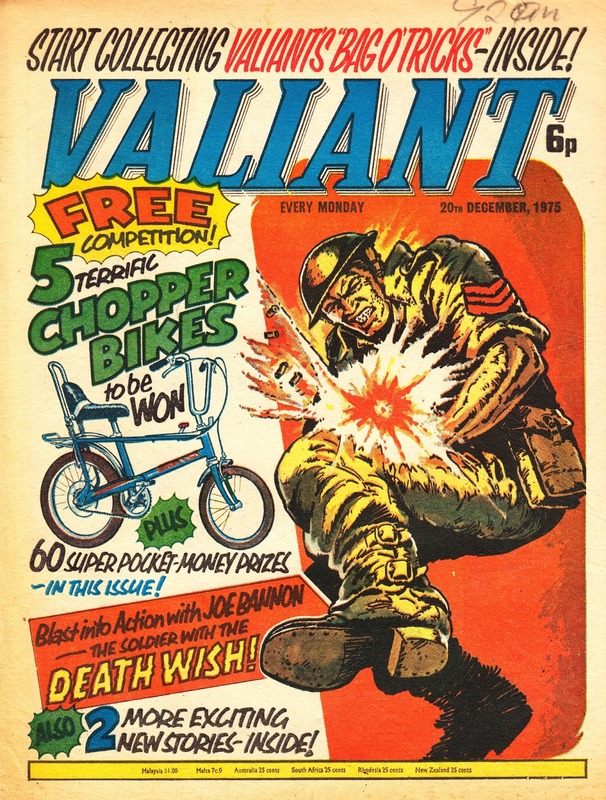 VALIANT (not to be confused, of course, with VICTOR or VALOUR) was no stranger to mergers itself, having been IPC's go-to title for closures for two decades. Sharing the masthead, at one time or another, were KNOCKOUT (1963), SMASH (1971), TV21 (1971), LION (1974) and VULCAN (1976). Spin-offs included the usual annuals, specials and the VALIANT PICTURE LIBRARY (an in-name-only spin-off) launched in the summer of 1963. 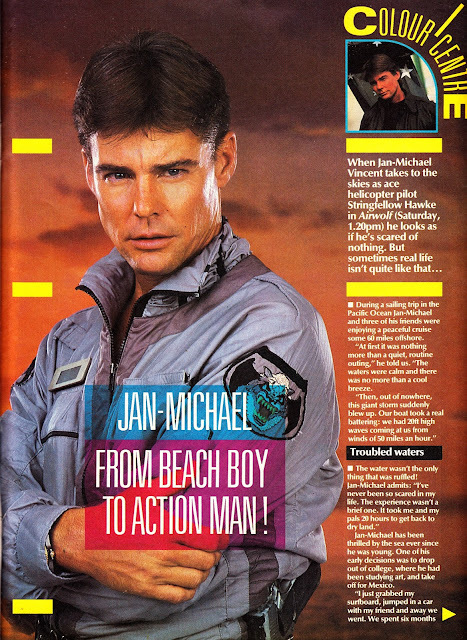 From September 1986: A LOOK-IN cover and centre spread devoted to Jan-Michael Vincent and AIRWOLF. 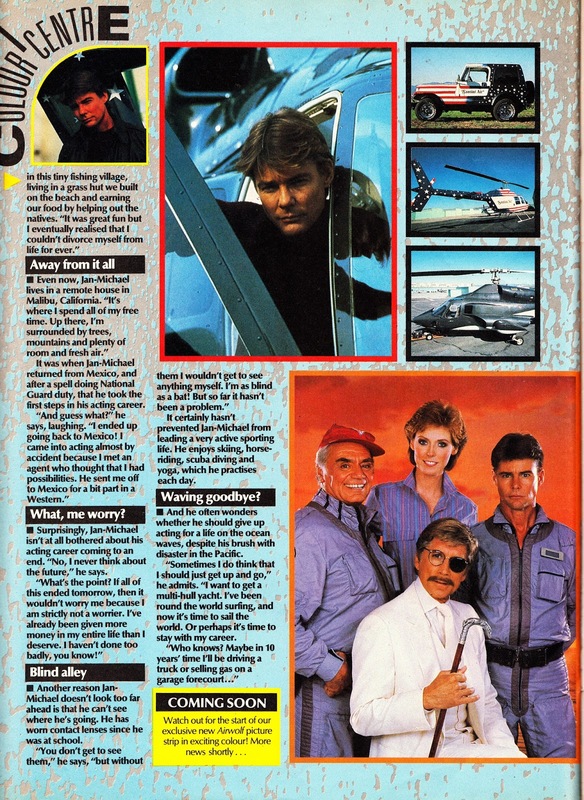 It's interesting to note that the show had already been relegated to Saturday afternoons (LOOK-IN hadn't even got around to launching their comic strip version) despite starting off as a fixture of the primetime schedule (and the sauced-up home video version of the pilot was a certificate 18 release). AIRWOLF's new early afternoon, before-the-shops, slot made it part of the essential post-WORLD OF SPORT (axed the previous September when ITV ran out of decent sport) schedule of SAINT & GREAVSIE and WRESTLING. From December 1998: the 39th issue of HORIZON, The magazine of THE BLAKE'S 7 APPRECIATION SOCIETY. From March 1985: The end of the dirt track for IPC's venerable TIGER. Published weekly (barring, no doubt, the odd bout of industrial action) since September 1954, the sports-centric 'paper' was a mainstay of the IPC Youth Group offering for decades and ultimately clocked-up 1555 regular issues and who-knows-how-many spin-offs. Along the way it spun off ROY OF THE ROVERS into his own weekly in 1976 and - as was the IPC way - also absorbed a lot of its own, more vulnerable, sibblings. 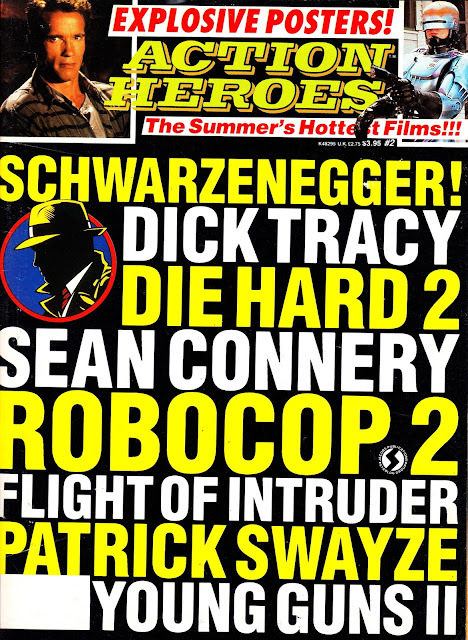 HURRICANE, JAG, SCORCHER and SPEED all shared the masthead at some point. Unusually, the combined EAGLE AND TIGER ('Big news for all readers...') was a pretty balanced combination of the two weeklies. It really felt like someone in management thought TIGER deserved a fair send-off. Of course, over time, the TIGER strips started to fade away and the shared masthead became smaller and smaller... and eventually (and with no fanfare) vanished entirely. The Tiger logo was even redesigned for the merger so that it sat neatly alongside the Eagle's. I was never a fan of TIGER so the merger - whilst a bit of an event - wasn't 'great news' for me. 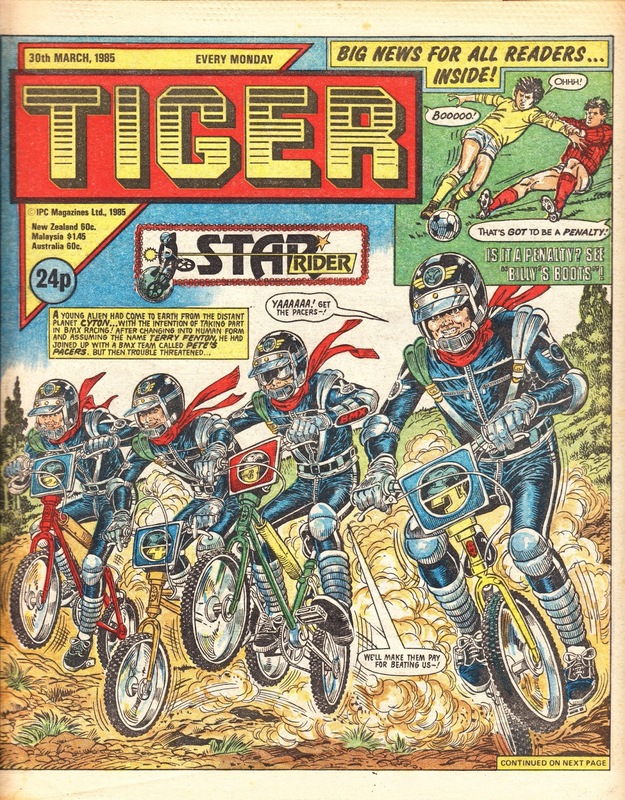 Indeed, the likes of Star Rider and Golden Boy were strong clues as to why Tiger was no longer in business. 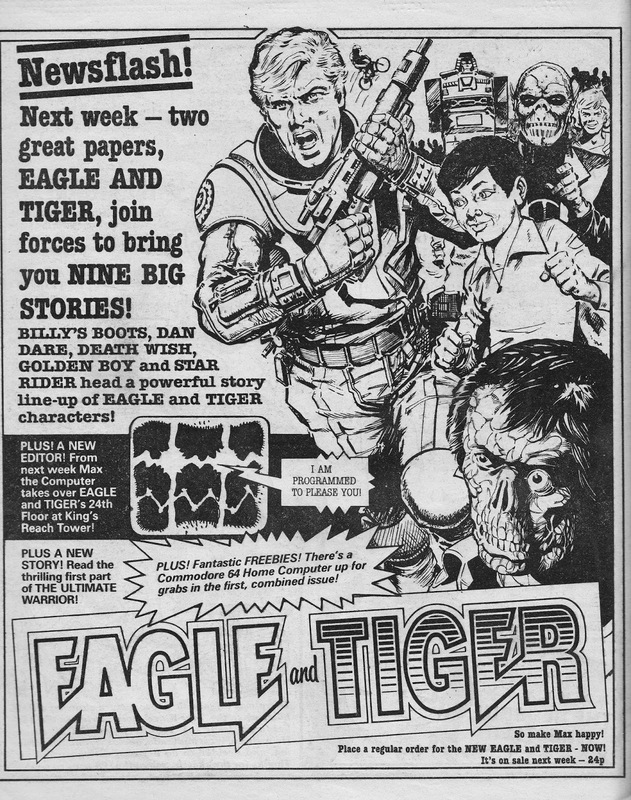 I had only ever bought one copy, published the previous summer, which just happened to be the week that BATTLE, EAGLE and TIGER all gave away free ACTION FORCE figures. Palitoy's purge of their warehouse overstocks is still, officially, the Best Free Gift. Ever. I probably ended up with several copies of that week's Tiger (I was already reading the other two) but I don't remember actually reading any of it. But I recently bought a copy of that very same once-owned issue (with convention-busting Billy's Boots cricket cover!) with the intention of finally getting around to dipping in. 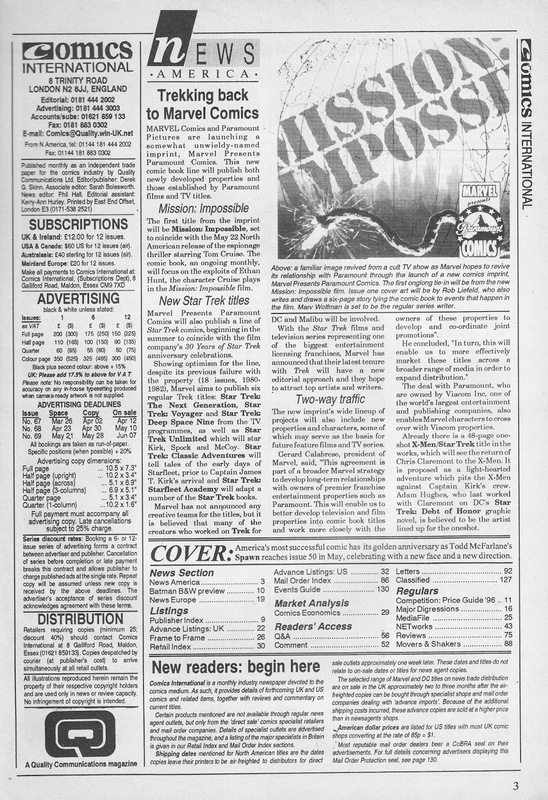 From March 1996: CAOMICS INTERNATIONAL issue 66 reports the launch of the MARVEL PRESENTS PARAMOUNT COMICS imprint and the return of the STAR TREK publishing franchise to the House of Ideas. The tie-up was quite productive (as you'll see from previous posts) over a two-year period but is best remembered for flooding the market with more STAR TREK comics than ever before (and snatching the license away from DC). In addition to the Trek books, a few other one-shots based on Paramount properties also snuck out before the deal was wound up as Marvel's financial position became ever more dicey.